Shian Cottage is a farm holiday cottage which we renovated during the winter of 2013/14. 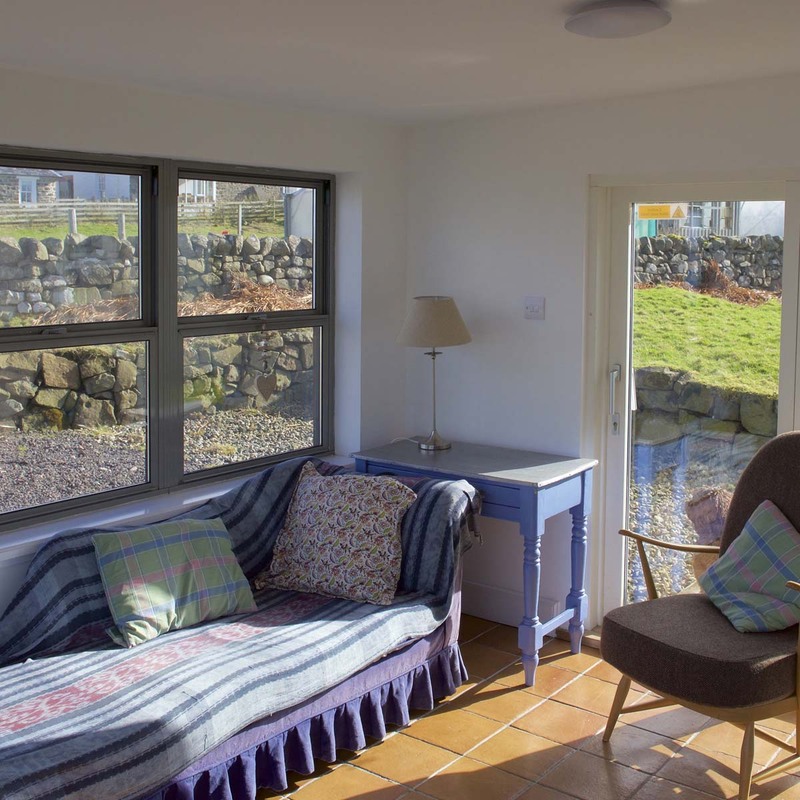 As well as improving the windows and adding wall insulation to external walls, a small (unheated) sunroom was added, which is a great place for enjoying the views and midsummer sunsets! 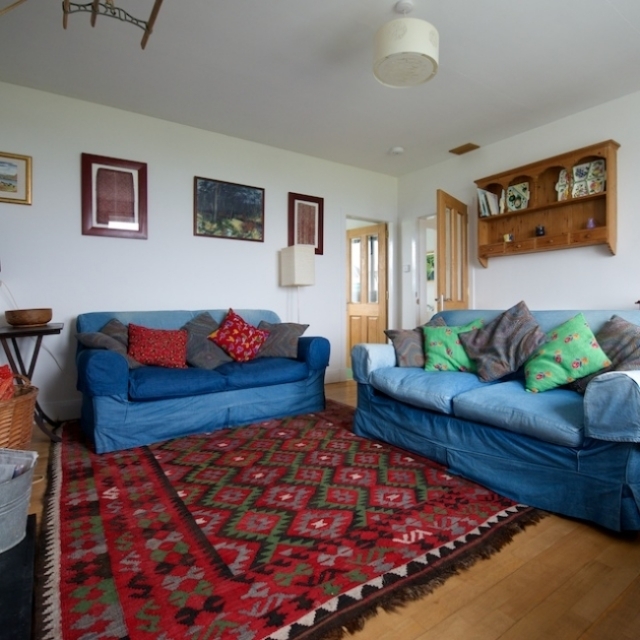 Shian is a perfect cottage for a couple or a family with small children. 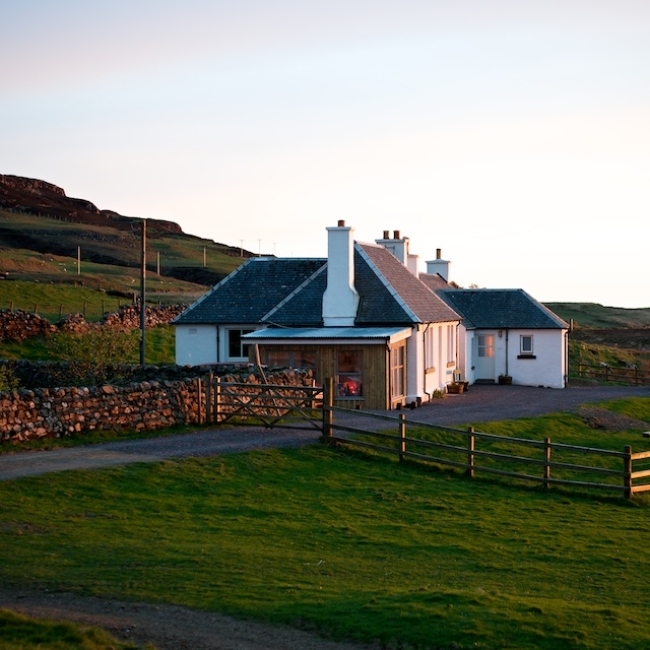 This cottage, and its neighbour Duill, were originally traditional farm workers cottages, so their rooms are smaller than modern-day cottages, but they have been carefully furnished and decorated to create comfortable and characterful accommodation. From £345 – £615 per week. Which cottage to choose? 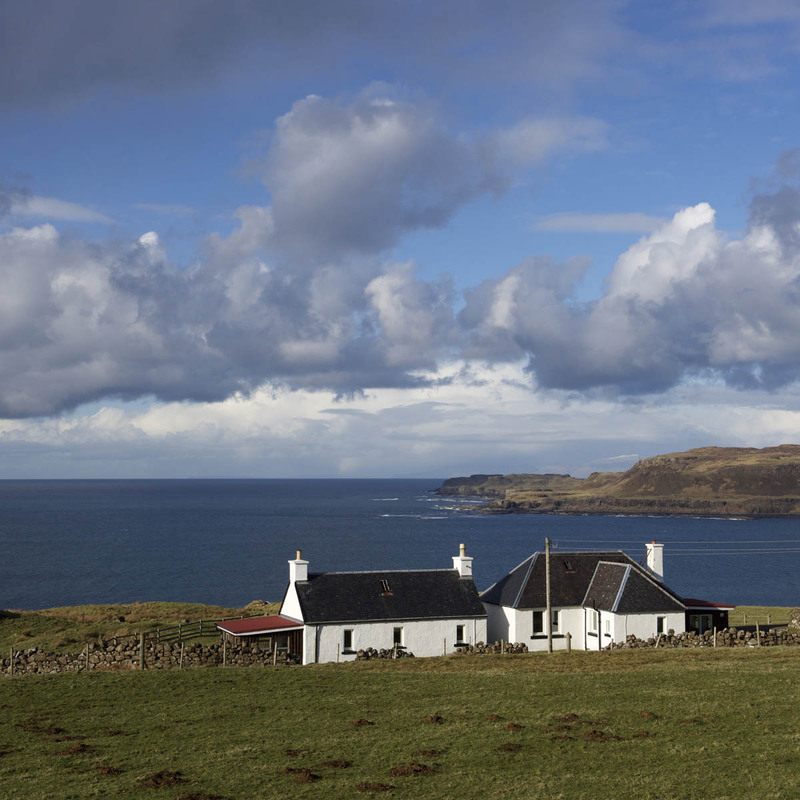 Treshnish or Haunn? 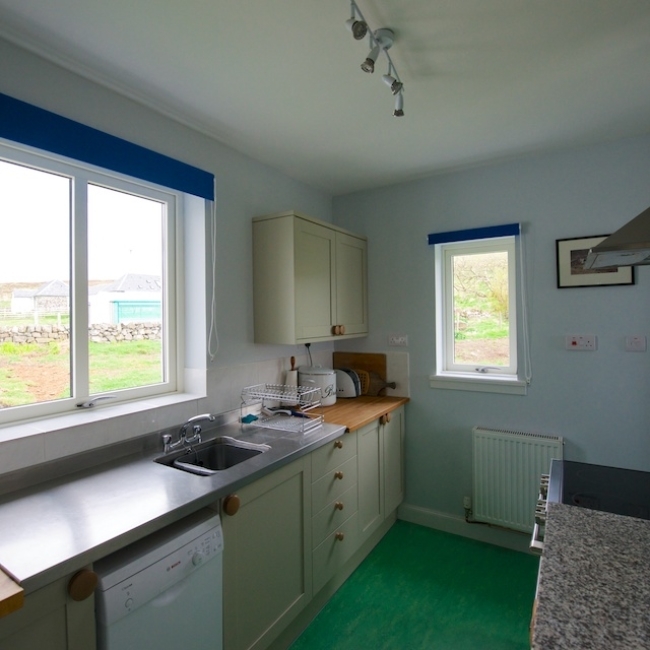 There is a practical kitchen with fridge/freezer, ceramic hob cooker, dishwasher and washing machine. The welcoming living-room forms the heart of the cottage with its cosy wood burning stove, comfortable sofas, small library of books and games, radio/CD and the dining table sits in front of the window which has the best view of the sea! It also has a flat screen TV with built in DVD player. 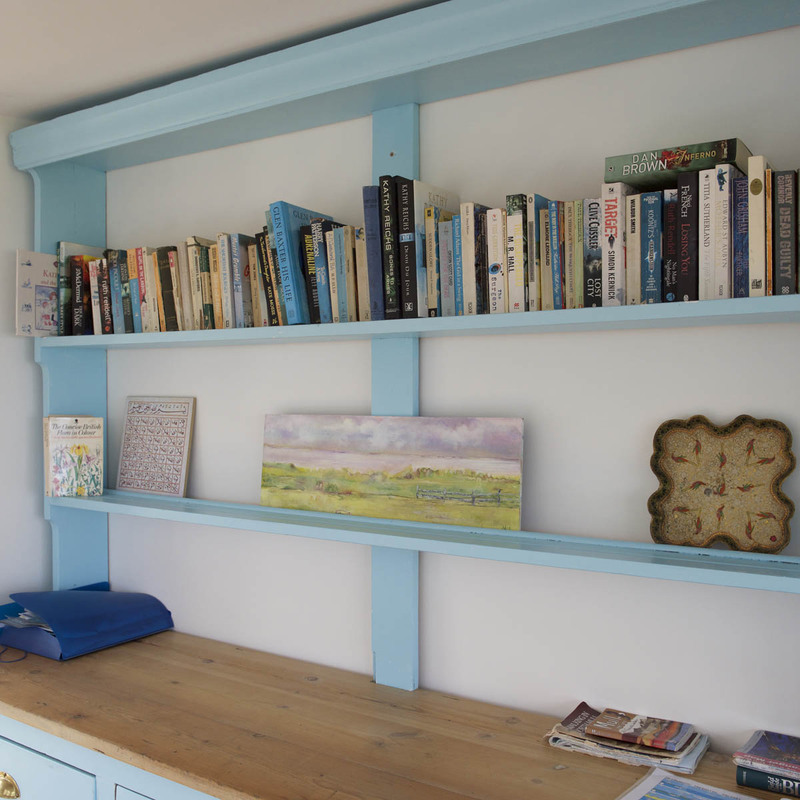 All rooms lead off a small central hall with reclaimed beech Junckers flooring. 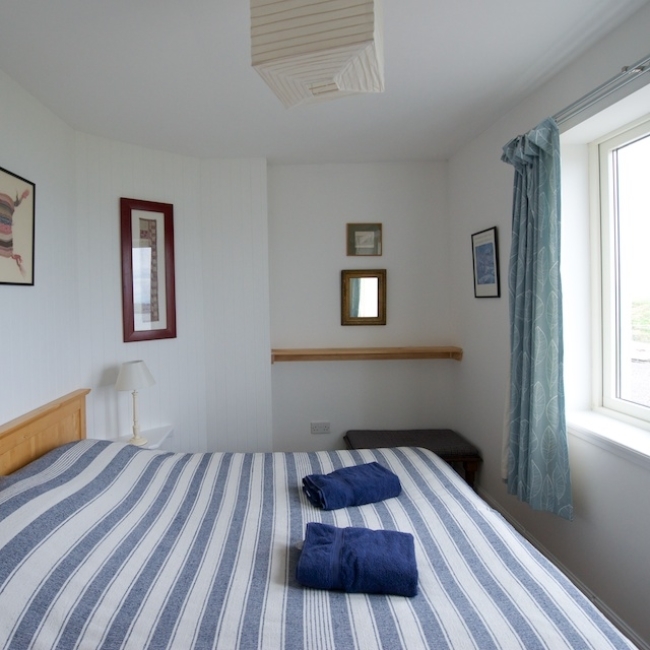 The double bedroom has a king size bed and a wonderful sea view. 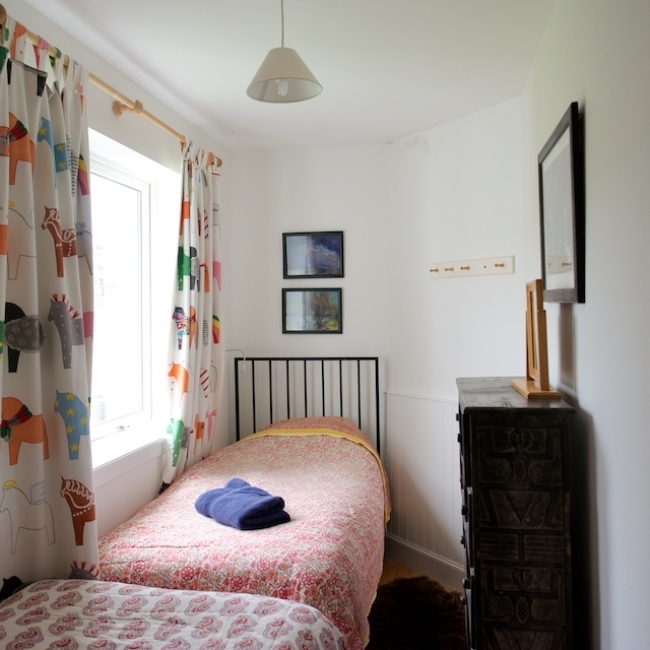 There is a narrow second bedroom with an adult-sized single bed. 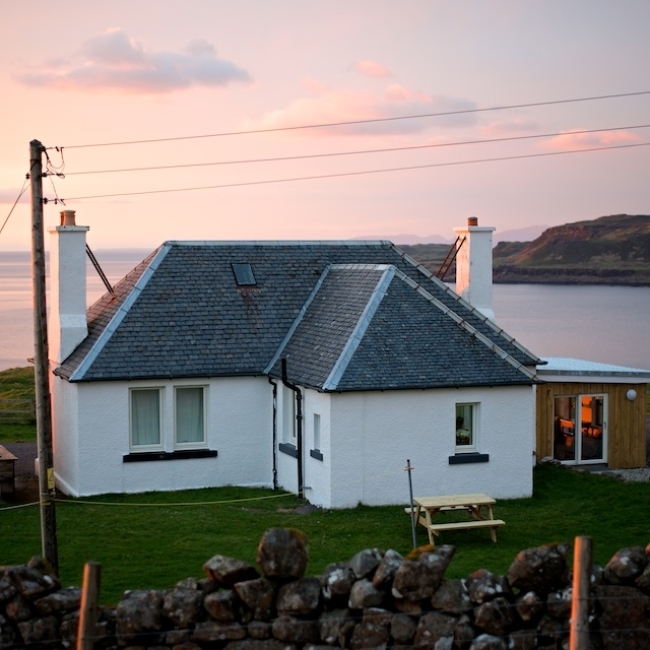 Both bedrooms have reclaimed beech flooring and bedside sheepskin rugs produced on the Isle of Skye. 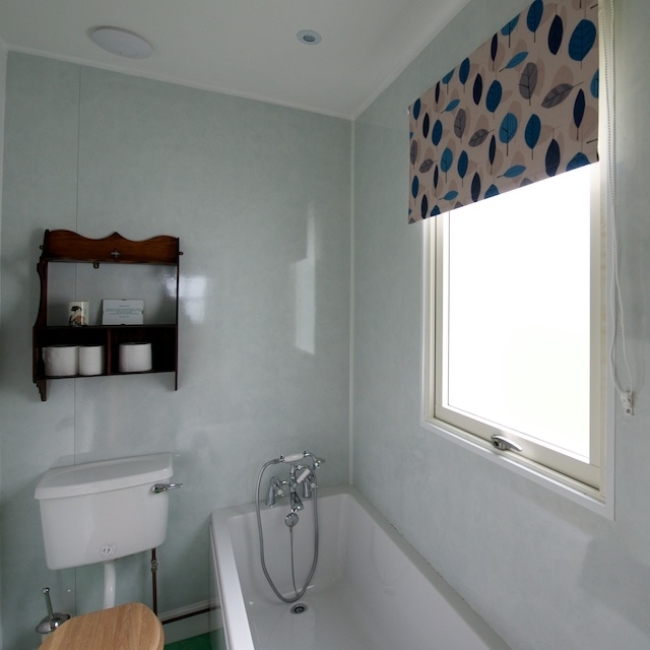 The bathroom, with bath, washbasin and lavatory, has a ceramic tiled floor. The sunroom (or ‘sitooterie’ as we call it) was built using reclaimed windows. It is deliberately unheated, and has an external thermal door between it and the living room so that there is no heat loss from the cottage to the sunroom. 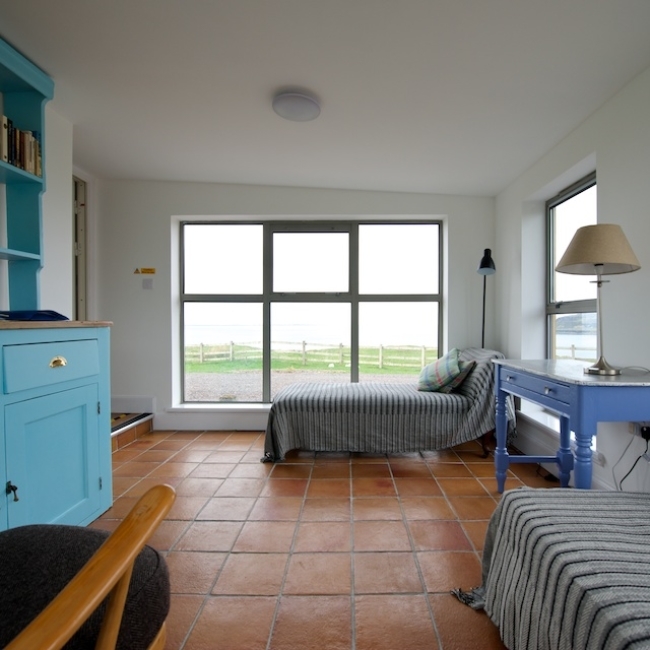 It has a Fired Earth tiled floor and comfortable ‘chaise longues’ (daybeds) to recline on whilst admiring the views and enjoying ‘outdoor space indoors’. 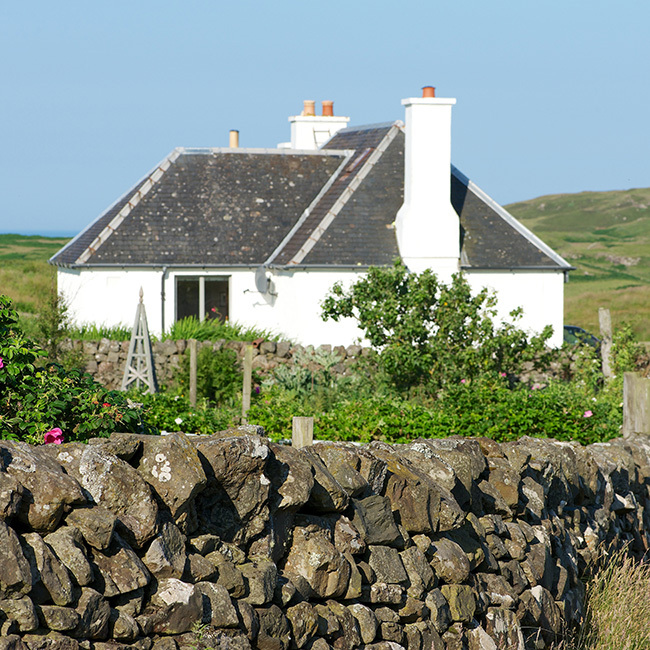 Shian shares an enclosed grassy garden and washing line with its neighbour Duill. 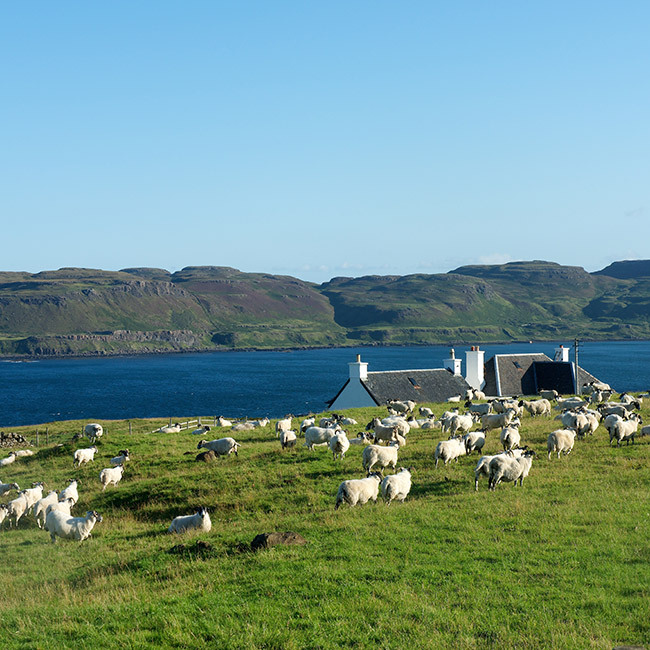 *Due to our remote location we are unable to get conventional broadband through the phone line. Thanks to the mobile EE signal coming from the Isle of Coll we have been able to install a mobile broadband router in Duill. There is a data usage limit of 10GB per week. It is not possible to buy an unlimited mobile broadband package.